The “Option Table” is the list of different sprockets that can be generated given your initial input. At the top of this list is the blue “Selected” option. When you click on “Preview” or “Download”, the selected option will be used to generate the preview or to download the STL files for 3D printing. If you click on a different row in the list, it will become the “selected” option. Ratio – refers to the ratio between the two sprockets that you are generating. At first, the ratio will start off with your input. But as you explore the different options that SprocketR helps you find, the ratio may change. Note that if you hover over the ratio, SprocketR will show you a ratio relative to one. Numbers of Teeth – as the name suggests, this refers to the two sprockets that will be generated and the number of teeth for each. Sprocket Diameters – the generated sprockets will have these diameters. Note that this represents the pitch diameter of the sprocket. 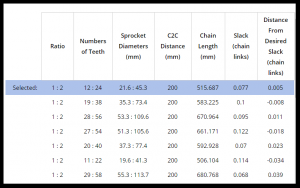 If you are using this number to understand the clearance you have in your design, you’ll need to add a bit of space for the teeth and the top of the chain as it rides on top of the sprocket. C2C Distance – this is the “center to center” distance for the axles of the sprockets. This distance will initially be exactly what you input. However, you can use the “vary” buttons to tell SprocketR that you are “ok” with changing the center-to-center distance if it gives you a better sprocket system. 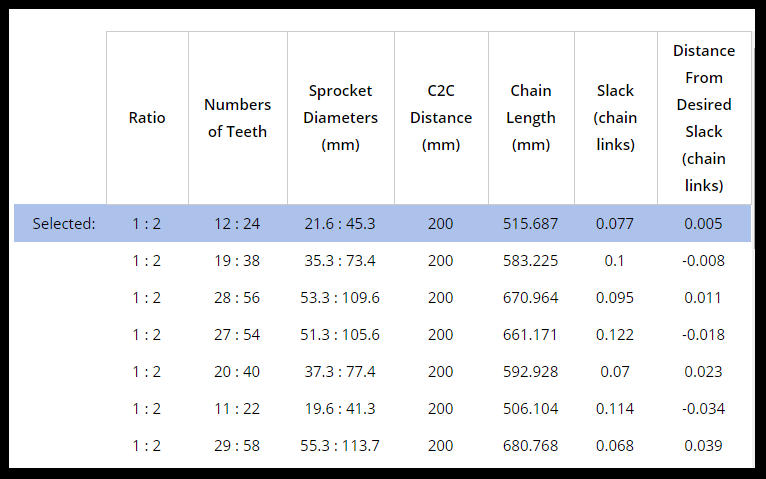 Chain Length – this represents the actual chain length measured in number of chain links that meets your input parameters the best. It is enough to wrap around each sprocket and give you the slack that you requested. Slack – the amount of slack that the chain will have if you use the Chain Length specified and the sprocket options that you have input. The slack is measured in “chain links” and could be multiple links if you have asked for a lot of slack in your design. IMPORTANT – when you initially specify the amount of slack that you want, you give it in terms of percentage. This is the percentage of the entire chain length that you want to add for slack. Distance From Desired Slack – It is usually impossible to get the exact amount of slack that you ask for, and fortunately the exact amount isn’t normally important. However, this column lets you know just how far away from your desired slack that the associated row would be. It is given in “chain links” – in other words, a selected option may be .5 (or half) of a chain link away from the slack that you asked for. Sprocket Width – The sprockets that are generated from SprocketR are meant to be printed on 3D printers. We have tested both PLA and ABS with great results. However, we realize that different printers have different resolutions and abilities to accurately print sprockets. So the width of the sprockets have been set to be slightly smaller that the width of the specified chain track. This means that your sprockets will probably fit your chain, no matter what printer you use. In the future, SprocketR may include a “bevel teeth” option to make fitting your chain even better! What if the sprocket is too wide? – If the sprocket is too wide after printing on your printer, you will need to try printing again, but this time use your printing software to make it narrower. However, only vary the Z parameter. The X and Y must remain the same so that the sprocket will fit the chain. What infill should I use? – In general, for a strong sprocket, you should use 100% infill. However, it takes a lot longer to print a 100% infill sprocket. We normally print the first one at 20% infill until we are sure that we have completely figured out our design. THEN we print it at 100%. Please see the related Chap Research project “3PSC” to see how we are characterizing 3D printed sprockets. ABS – stronger and easier to sand or otherwise machine. Though printing very flat sprockets is harder because the edges tend to curl-up, and flat sprockets are happy sprockets. Heated beds make a BIG difference and also a glue stick is key. PLA – not as strong as ABS, but appear to perform very well. The edges don’t curl-up on PLA as they do with ABS, but you still need to use something to keep the work down. We are guessing that our research will give a slight nod to ABS for strength, but stay tuned to the related Chap Research project “3PSC” to see how we are characterizing 3D printed sprockets. Sprocket Beveling – Sprockets work better of the tip of the teeth have a slight bevel so that they can easily guide the chain onto the sprocket. SprocketR will have beveling in the very near future. In the meantime, however, it is a very good practice to put a slight bevel on the sprocket teeth using sandpaper (or even a belt sander).